Take a screenshot with your mouse hovering over the minimap while it's zoomed all the way in so we can see the sector name. Host on an image hosting site, such as Imgur, Gyazo, Lightshot, Flickr, TinyPic, etc. For art issues related to characters, weapons, armors, or items, please post in this thread. We appreciate everyone's help with these issues. Thank you! Would be nice if this could be fixed. I don't know how exactly this works but I found something that might cause fps drops in the desert highlands. 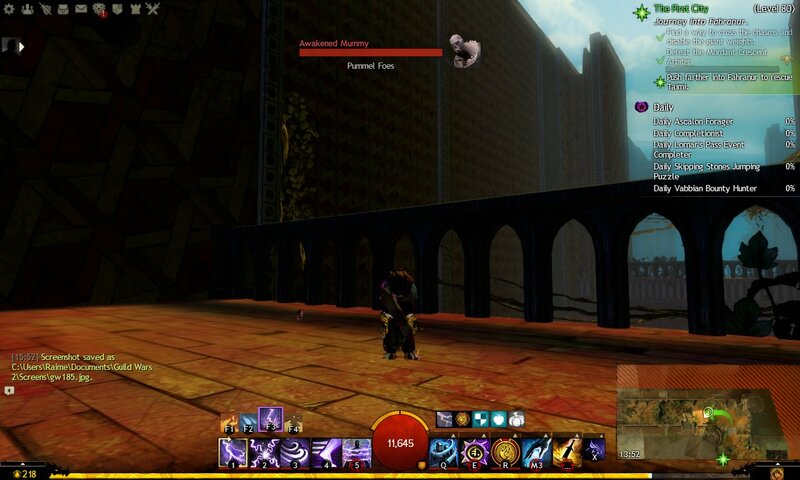 In the new branded area in Domain of Vabbi there is a graphical bug with the purple "fury of the brand" overlay around the screen. A solid black line passes through the lower half of the screen when it is active and fades away when it goes away. I've linked videos reproducing it. This video I leave the UI on to show the black line coming and going with the fury of the brand debuff. Second video I turn the UI off and the problem goes away. 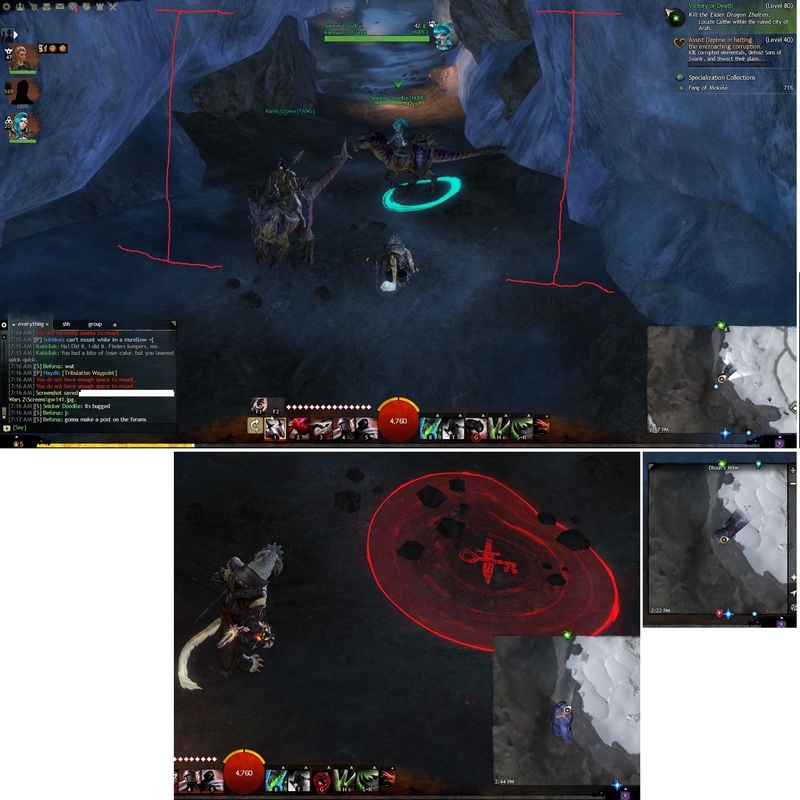 I don't have a screenshot (login server is down) but on my ranger (equipped with longbow) when I dismount the raptor by using the attack skill while targeting an enemy, the ranger's body glitches in a permanent twist (i.e. 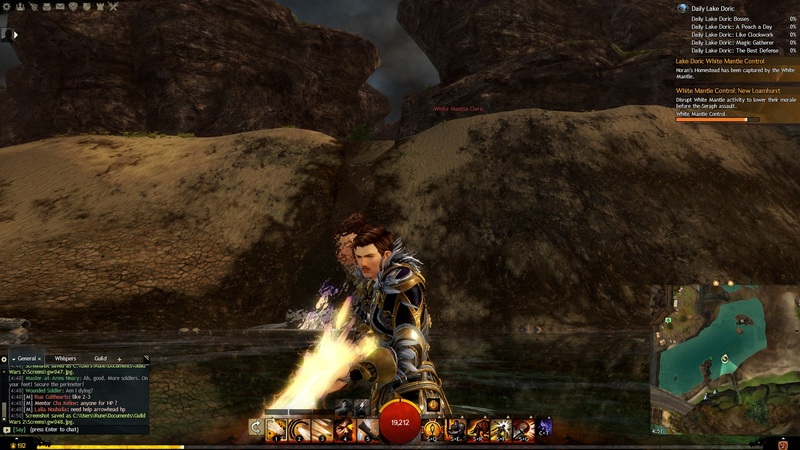 the character was looking at the enemy from the side and gets frozen in that position permanently until I remount again). It looks very weird in that the ranger is all twisted to the side while shooting the bow instead of looking at the enemy (and the direction of the arrows). The ranger is human male if that makes any difference. 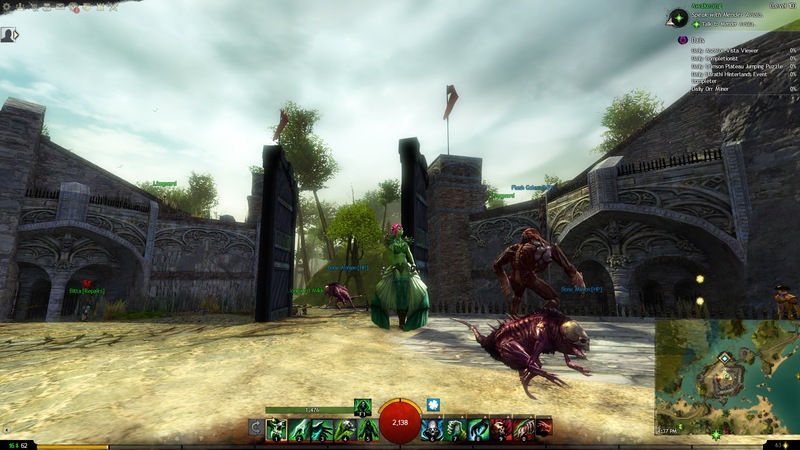 My pet was riding one of my mounts during combat with the Champion Perturbed Choya bounty in the Desolation. I did not see the issue, the screen shots were taken by the Engineer accompanying me. The Iboga was my current pet. The Springer was not the most recent mount I had used, that had been the Raptor. The mounts I had at the time were the Rapter, Springer and Skimmer. My character is a male human Ranger (Soulbeast) welding a bow and dual daggers. I was not merged (melded) with my pet at the time. Aside from my Ranger and the Engineer there were no other players around. Experiencing the same issue, hiding UI makes it disappear and changing the scale of the UI changes the position of the line. Judgement, instance map of the story. I jumped into a hole and i can not get out of it. 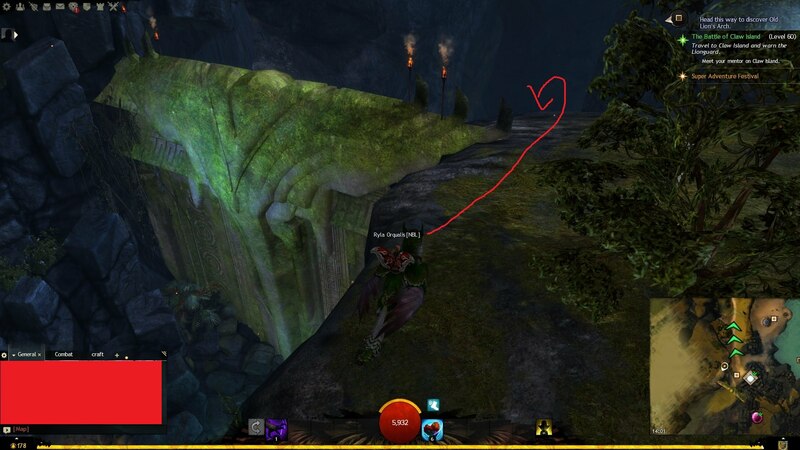 The northernmost tunnel inside Dissun's Mine that runs to Steelbrachen in the Dredgehaunt Cliffs map has an invisible wall. I took multiple screenshots and then threw them together in one screen. 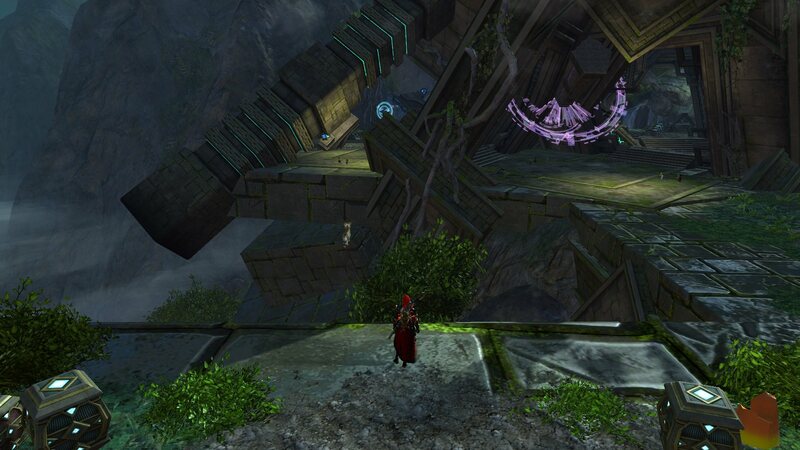 Other characters also run into this 'wall'. edit: Also, the area is 'underground', so the minimap considers the 'wall' to exist. All the chests on the ground floor are positioned partially in walls. Simple fix no doubt. Same problem but I figured out what causes it. 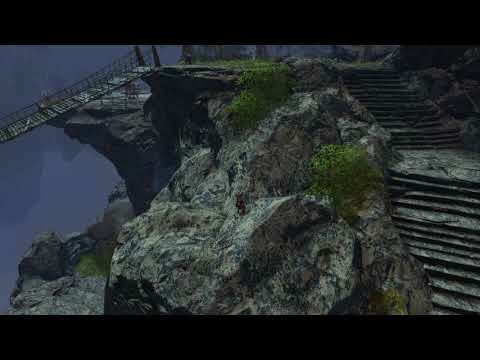 (Hmm in the old forum, the map-issues-thread used to have screenshots uploaded - storage issues? - or why is this no longer viable on the new forum? I am reporting two known bugs. One bug block/obstruct me from completing my objective. First bug. I have used the in-game /bug report but I do not believe it will be looked at. This is why I am here. 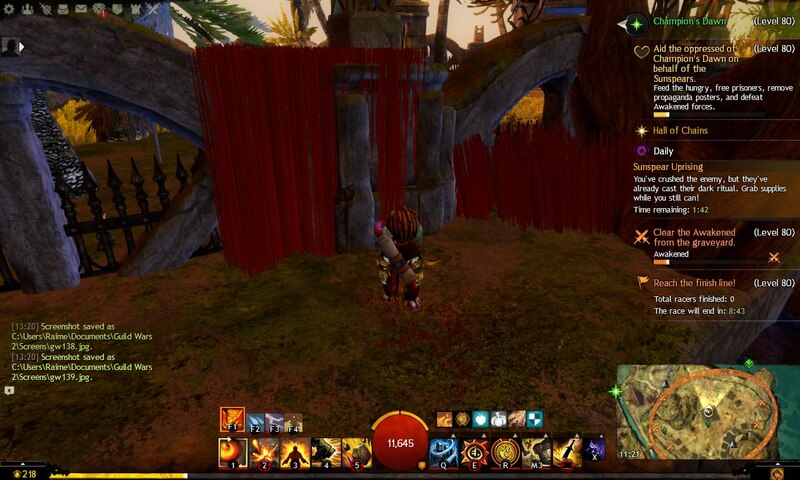 I am doing "No Mask Left Behind" and one of the mask has been blocked off by an invisible wall. It is the 21st mask I believe. 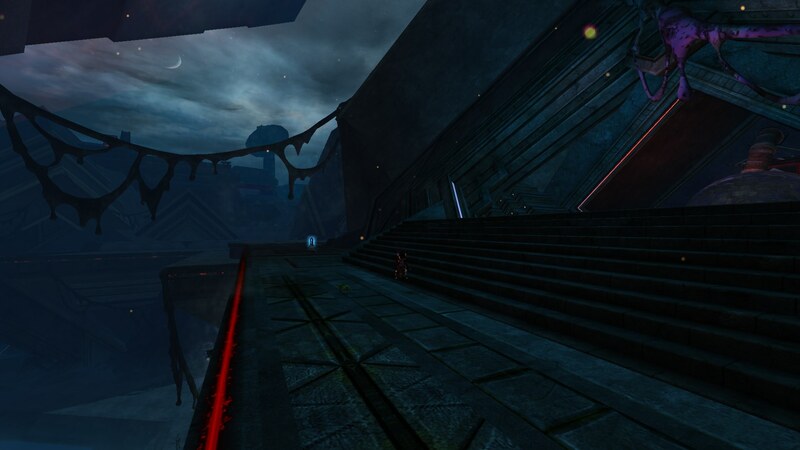 It is "Southwatch Creep: Look to the east by the top of the Tarir entrance". The newly placed invisible wall had just been put there by mistake I think. I cannot go close enough to pick up the mask. Second bug. This is the graphical glitch. 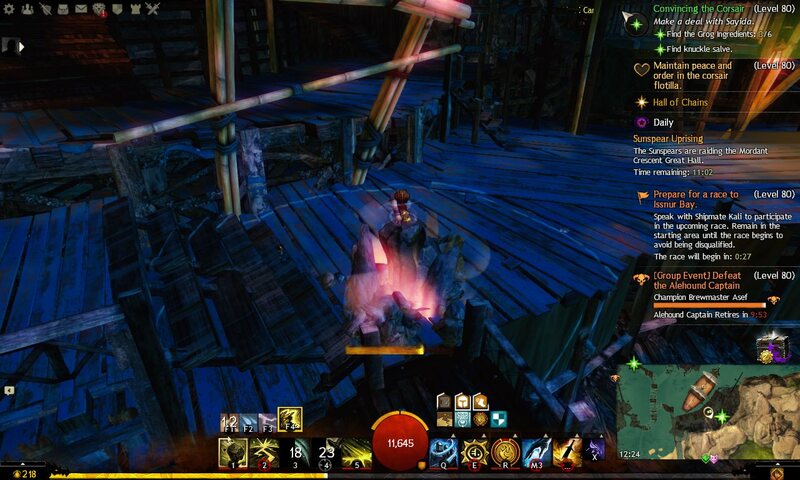 After the Auric Basin meta event is successful, heading into the first room, right at the door, the door somehow make my character or the door frame invisible and flickering until I walked past it. Thanks for looking into this. I need to finish my "No Mask Left Behind". Dark Library - map does not line up to area. I haven't been able to find this report anywhere else on the forums. I'm in the Dark Library and the map isn't lining up to anything I'm experiencing. The "helpful" locations the librarian points me to come up as being off map. If I bring up the map, it tries to pull far "south" but runs into the edge of the map art. I don't have my icon anywhere on the map. None of this is the end of the world, I just end up doing a lot retracing. It's just frustrating. Screenshots to come when I can get them to upload. 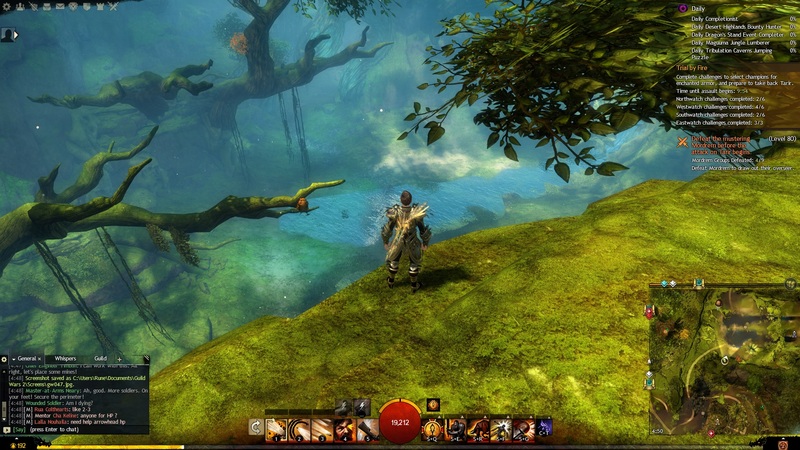 In HoT and PoF a new form of water is used; rivers. On max shaders these look somewhat fine, but on medium and low the reflections break. Following screenshots will be using reflection setting set to "All", medium shaders and max post processing. 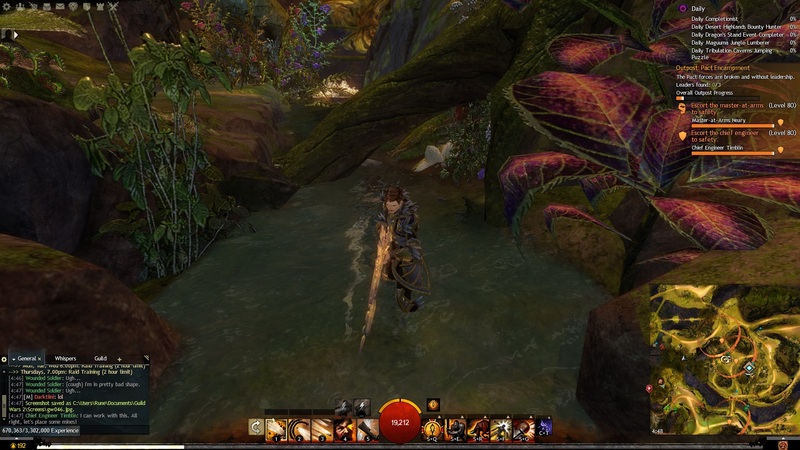 As can be seen, instead of reflecting (of which the option in the menus doesnt do anything on these river areas) it shows my character a bit larger and towards to upper right. No matter the angle or distance the proportion seems constant. 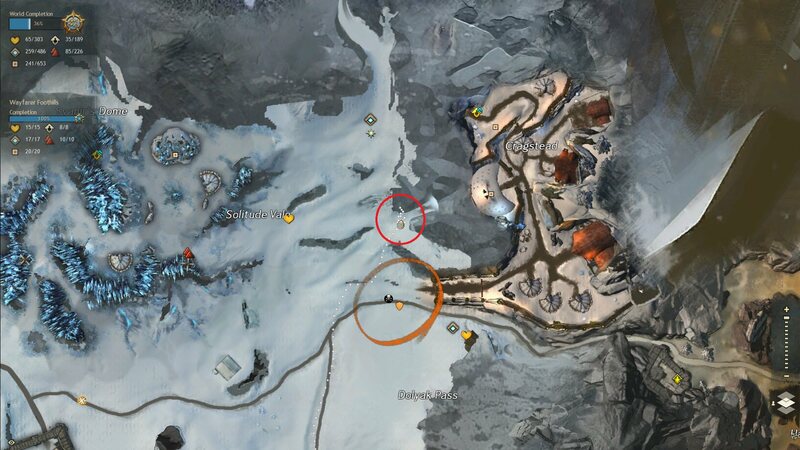 Location: WvW Alpine borderlands (green and blue), Garrison keep, southeast outer gate, supply depot wall. Issue: Wall textures pop in and out and flicker. On a fully upgraded T3 keep you will see textures for T1, T2, and T3 walls. 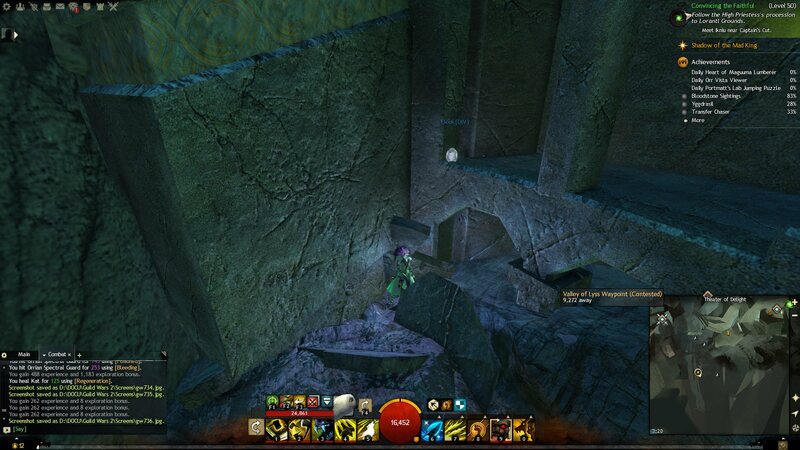 I'm stuck in the map inside the Scavenger’s Chasm Jumping Puzzle in Malchor’s Leap. It's really high up. I had 11 out of 12 Orrian Energy Sources (orbs) collected! Didn't do anything special (just jumping from place to place). Stuck between 2 slabs of rock jutting out of the floor. When completing the Lost Badge achievement in SilverWastes, a rock blocks the third badge making the achievement impossible to complete. The Shining Blade sailboat that is usually near Shining Blade Agent Bilman is currently missing. 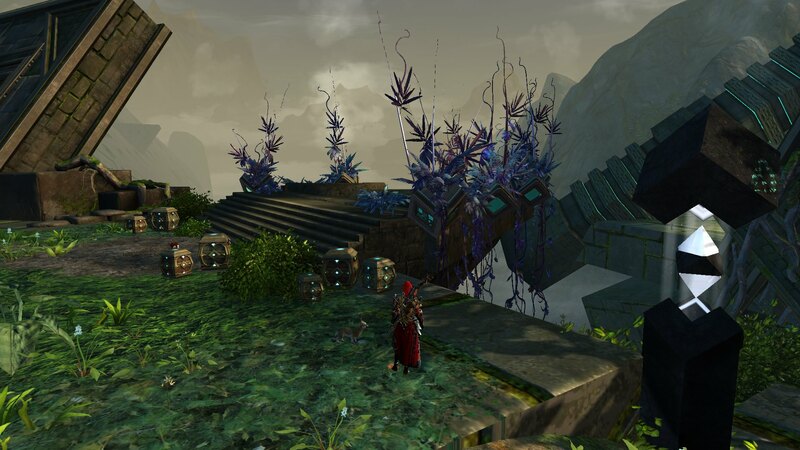 This is the boat that you sail to go from Lion's Arch to Siren's Landing as part of "On Orrian Shores" during "One Path Ends" LS3E6 . It seems to have disseapeared around the Halloween update that changed LA and was no restored when Halloween recorations were removed from LA. Currrently the green star you need to interract with to sail the boat sits on the water. 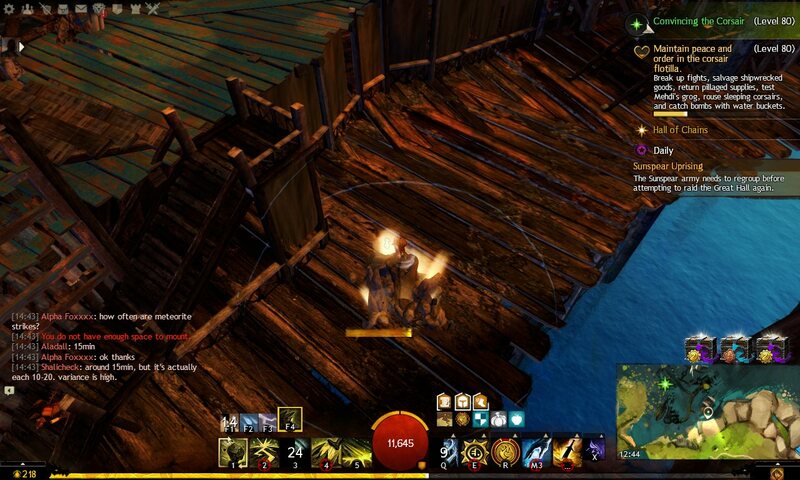 The boat does not appear either in the small cinematic when you use the green star to go to Siren's Landing. 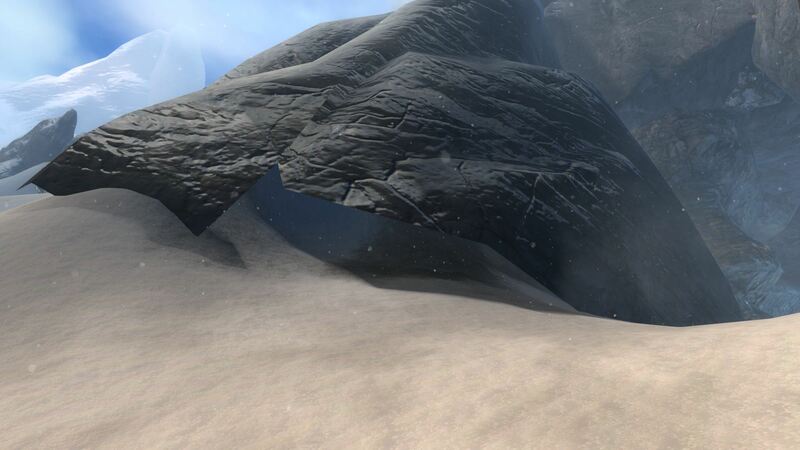 Found a "Textural/graphical issues with the environment" in Wayfarer Foothills. Pictures below. On the new LW chapter, first instance. Some textures seem to be missing. 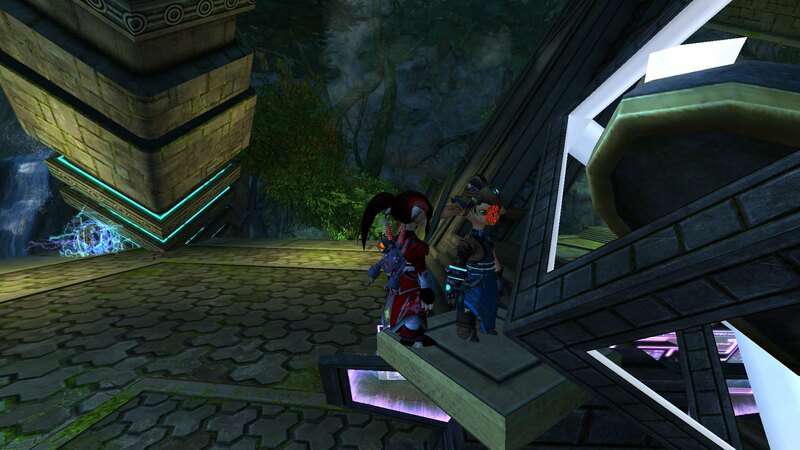 My character is female asura ele>tempest spec. 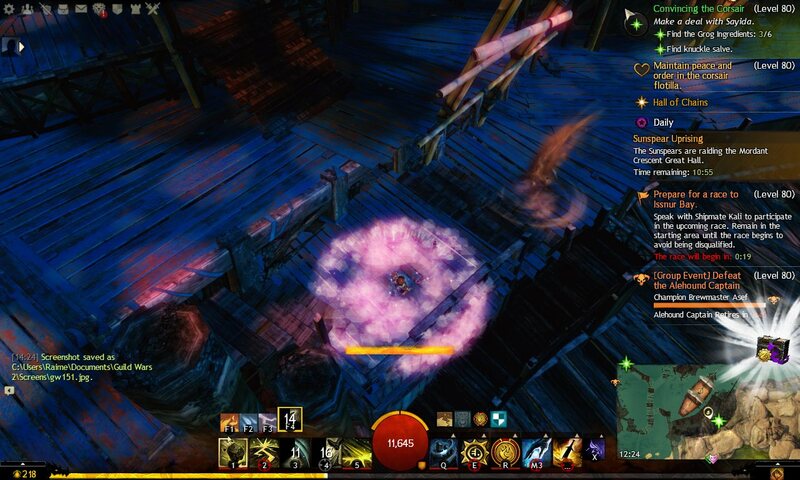 Eye of the Brandstorm story mission. Water in this map IS 96% alcohol. From this water they make elonian wine. Corsair Flotilla. At night time skills has pink colour. Can it be airship with red light cause that? I have no idea. At day time everything is ok.
1st city story mission. It's not a bug but it's poor design. Looks very cheap. Did you thought player will not look upwards? VERY BAD JOB GUYS. Was at Freetrader Haven and a shark was on the dock. It was marked red, but wasn't attacking anyone...just sitting there. I have a screen shot but couldn't add it. I can only add an image from a url, and the shot is on my c drive? go to (https://imgur.com/) click green button "New post" and drag drop your image to upload. Once uploaded, right click on image and select "Copy image address" and then edit your post, click the "Image" icon and paste address (ctrl + v). Nah seriously, I think you left a measurement model in Dry Top... I already reported it via in-game how to break out everywhere through many spots on the map, but this find is gold! 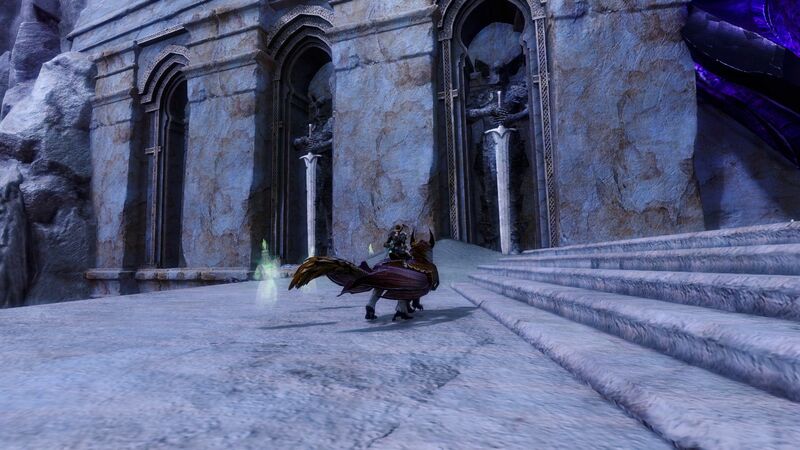 In the northern section of the palace there is a Feral Jackal standing near the trio of Djinn. This jackal is triple-spawned. I'm not sure if the added effects by their presence could have a negative impact on nearby players' game performance. 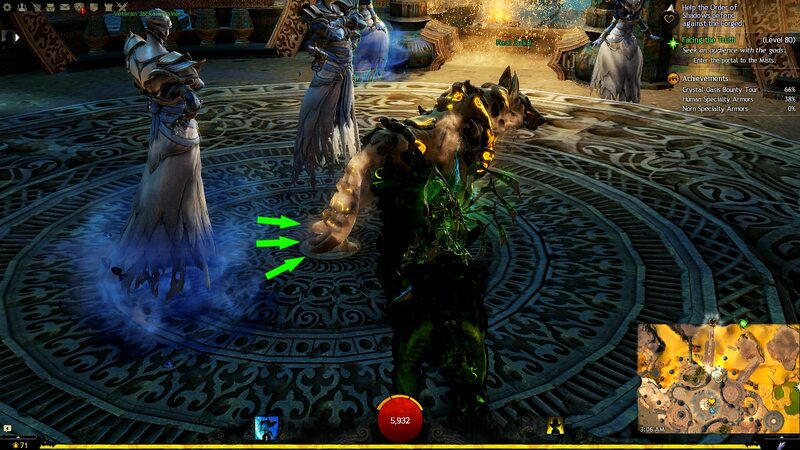 In front of the Djinn Jackal trainer are two rotating animated rings of characters on the floor. Nearby there is a transparent, semi-circle floor pattern where it overlays a portion of the animated rings, blocking them. This is apparent on both animated rings. Recommend: Removal of the excess transparent portion of the floor texture so it does not overlap the animated rings and block them from visibility. 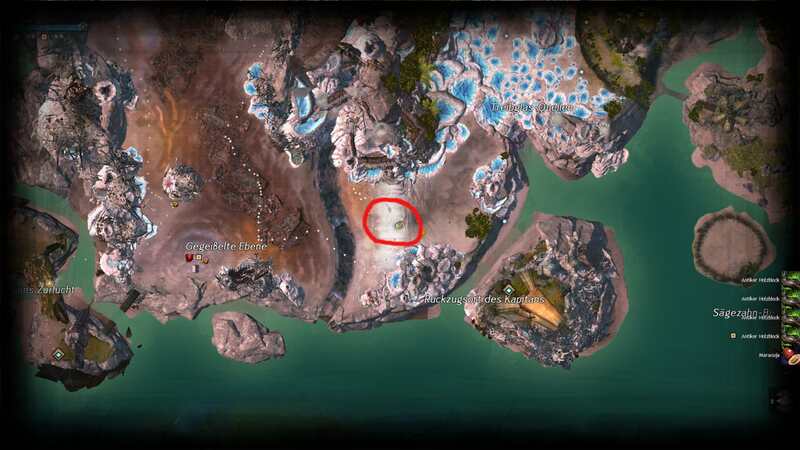 I found a graphic issue on the Southsun Cove, exact location is marked on the 2nd screenshot. Graphic settings are all maxed out. Restarting the game does not make the problem go away. There are holes that have appeared in the Grove. By the Great Helix on the 2nd level and the 2 entrances to the crafting stations. These are holes, not graphic glitches. It's possible to fall through them and walk below the map. 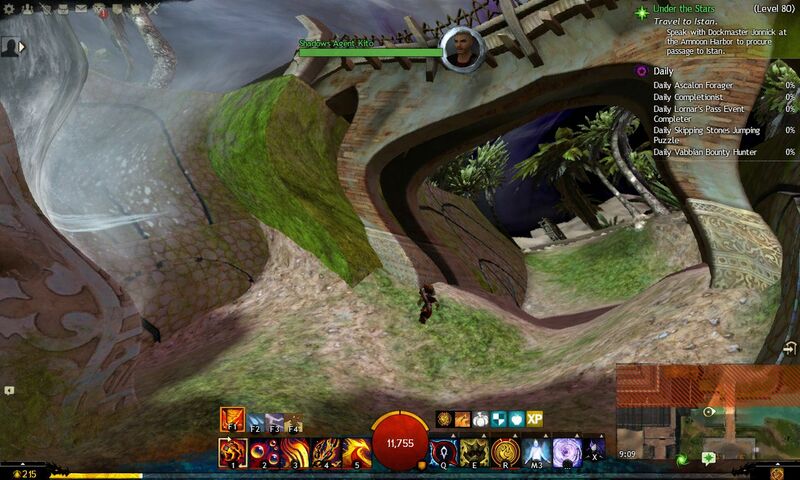 Lion's Arch. Invisble wall missing. 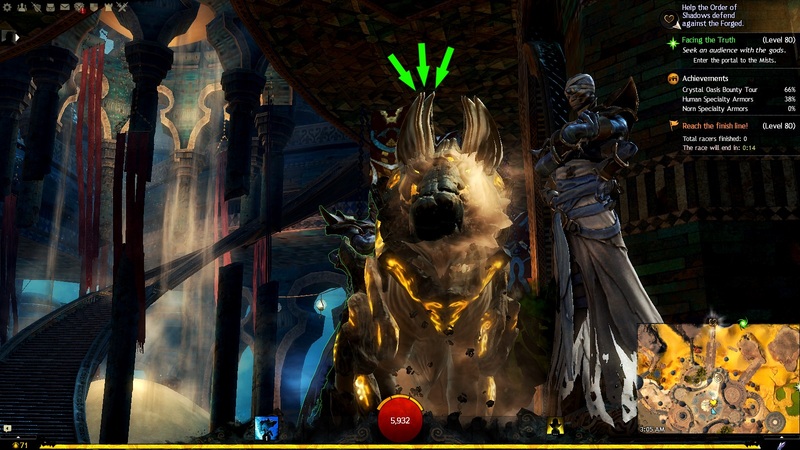 The big green gate with Caromi guards in front of it in the SW corner (behind the Shuttered Gate PoI) has an invisible wall that effectively prevents you from crossing above the gate with a Griffon. 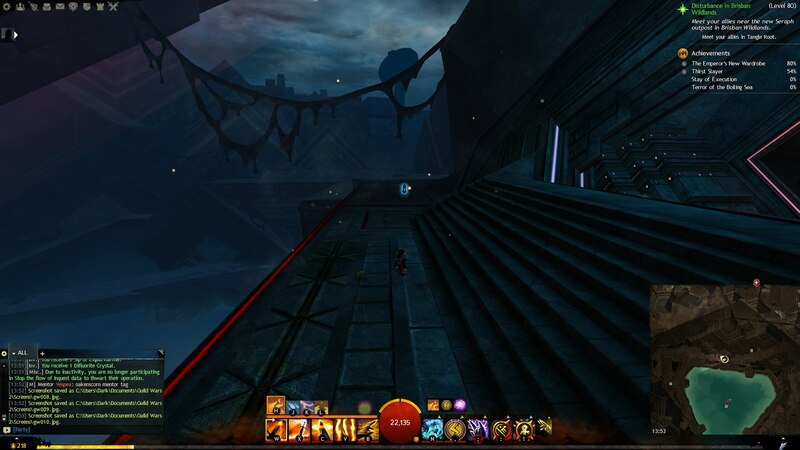 If you fly to the right-hand side (as seen when looking at the gate from the PoI), you can get on the cliff-top and from there you can move past the end of the wall through the invisible wall that isn't there and get down behind the gate and into the water underneath Lion's Arch. 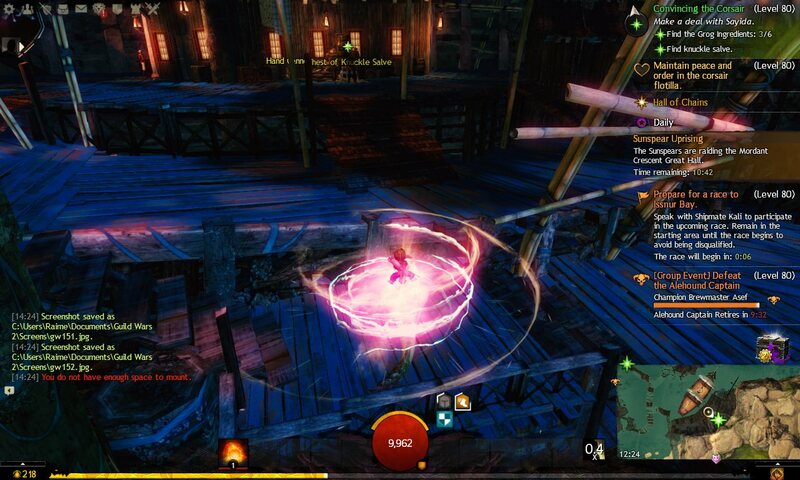 The sparkles over the minimap that appear over the WP discovery and HP completion seem to be stuck on my UI. 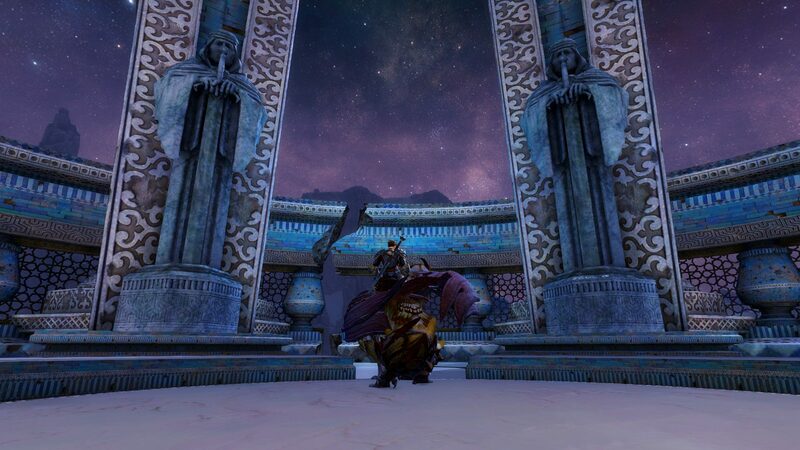 At the Tomb of Primeval Kings you find large statues holding swords at the entrance. These are the same used in Divinitys Reach and are representations of Seraph Guards. Rather odd to find these at an ancient tomb in Elona yes? 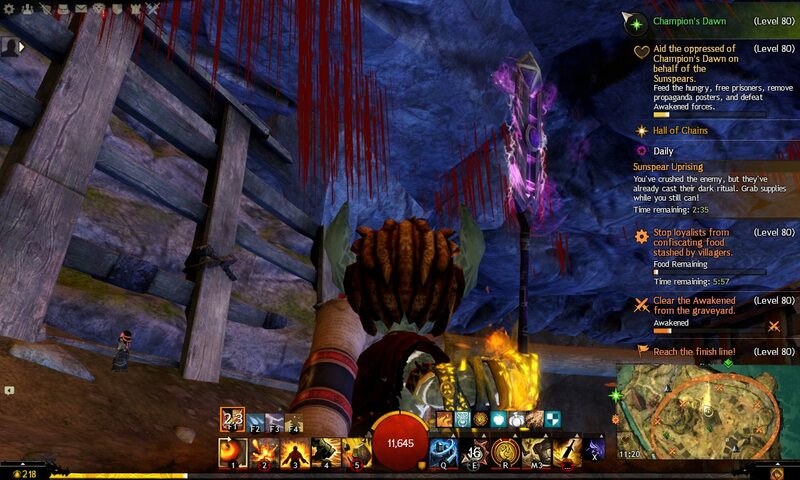 However, in the PoF guild hall i found these. 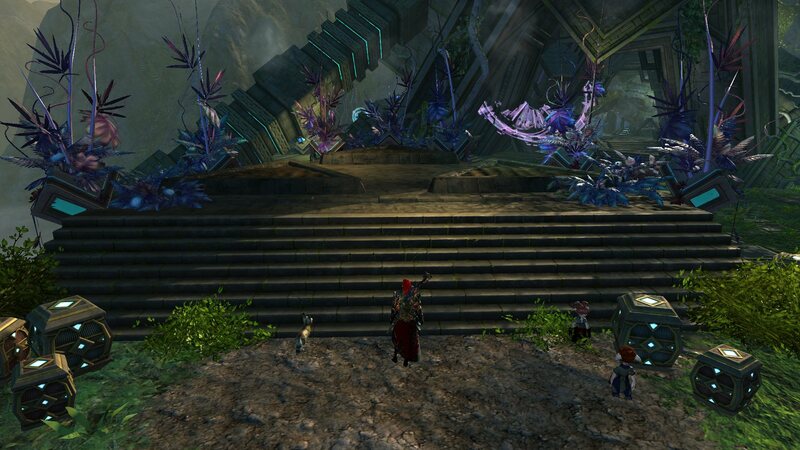 Old men jolding swords in much the same way as the Seraph Statues, but with an Elonian pedestial. 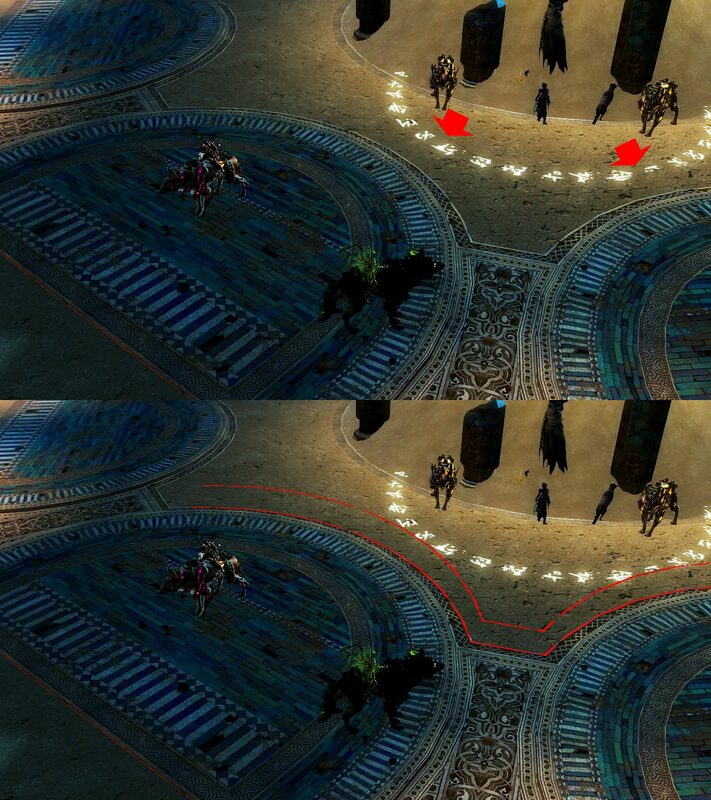 Were these the models meant to be placed at the tomb and not replaced once the Elonian assets were finished? I unfortunately don't have a screenshot of this since I was running in a fast-paced squad at the time and had to port away and get back, but this should be easy to understand. We were in the Domain of Istan, and I jumped into the tar pit with the legendary Smoldge bounty to join the others fighting it. 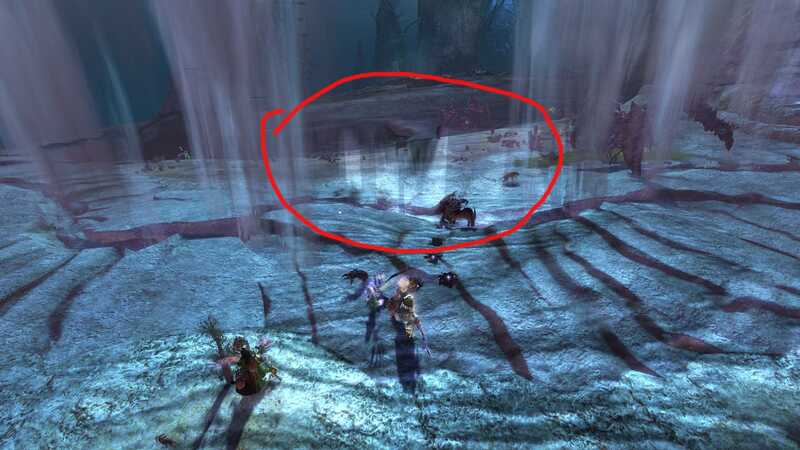 I fell through the world and ended up in water, looking up at the pit, and was able to swim around under the zone and even get on my skimmer (there was no 'you do not have enough space to mount' warning). I could clearly see objects above me, such as the Great Hall and the enemies inside. 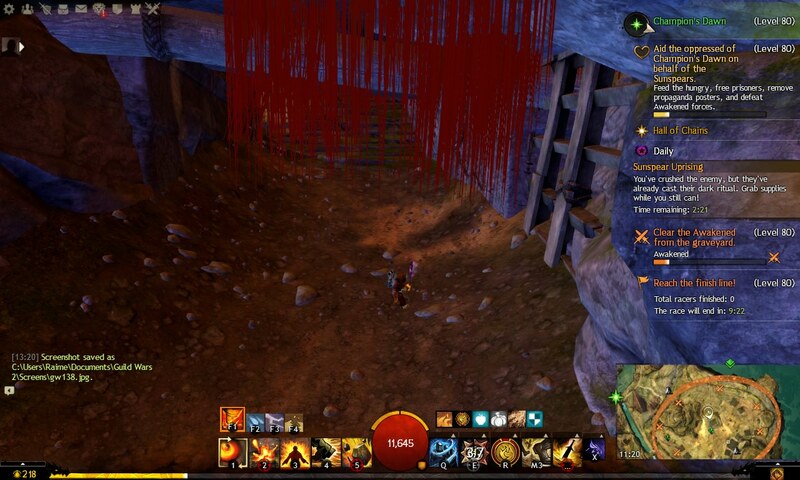 Found a "Textural/graphical issues with the environment" in Black Citadel. 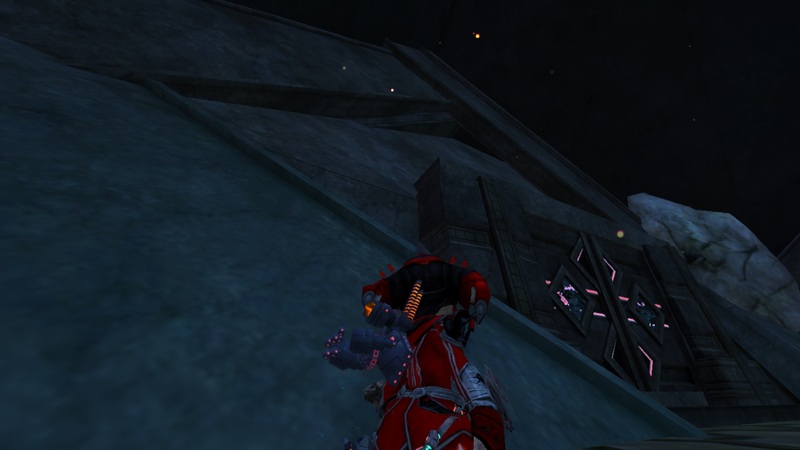 While standing in this place, most of the textures around disappear during the movement of the camera. Screenshots below. In sandswept Isles again (yeah..) an invisible wall/floor/Object? 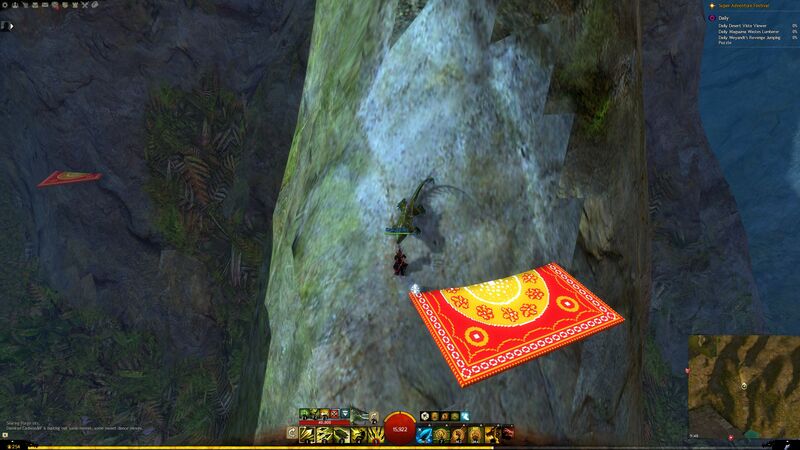 Surely better on the second screen, I'm literally floating over the floor. Don't know if it was planned to look like that, but here is a terrible clipping between giant stone sides in Sandswept Isles, In the south of the western complex, behind this door also an empty room with another door (for nothing?) with some issues too. Love the fact that you added new dogs and minies in the new map. I have owned Basenjis for many years. However, the tail is all wrong. Basenjis have a curly tail carried up over their back. Any chance you guys can fix this? Following the 8/28/18 update/patch, I noticed the following issue. 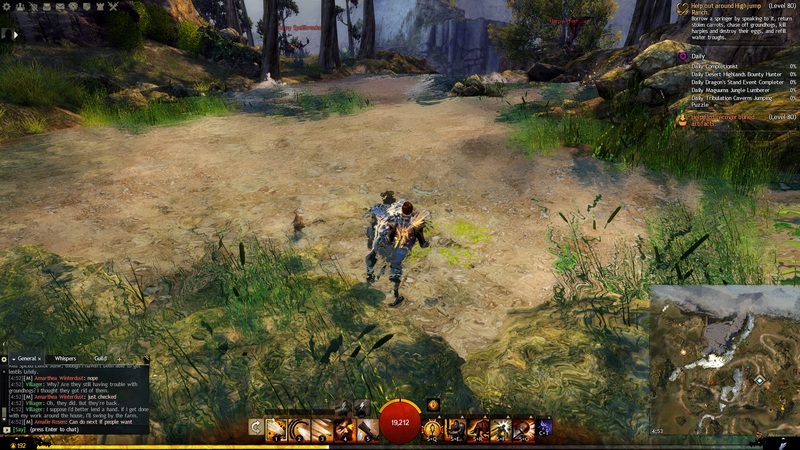 After entering any unranked PVP map (all of them I have been in), there is a layer order issue with the party/team UI. I see that on 8/28/18, a modification was made to the party UI for fractals, "Party UI in fractals will now show agony resistance instead of Mastery level," and I wonder if there were unintended/unexpected consequences. As you will see in the screenshots, the icon for the class is sometimes ON TOP of the character name. It does not seem consistent. The black background of the icon masks the first 1-2 letters of the character name. Visually, it looks to be a layer order issue. There is no problem with play given this observation, it's purely visual but it did not use to be this way so I wanted to point it out to you. Thank you as always! 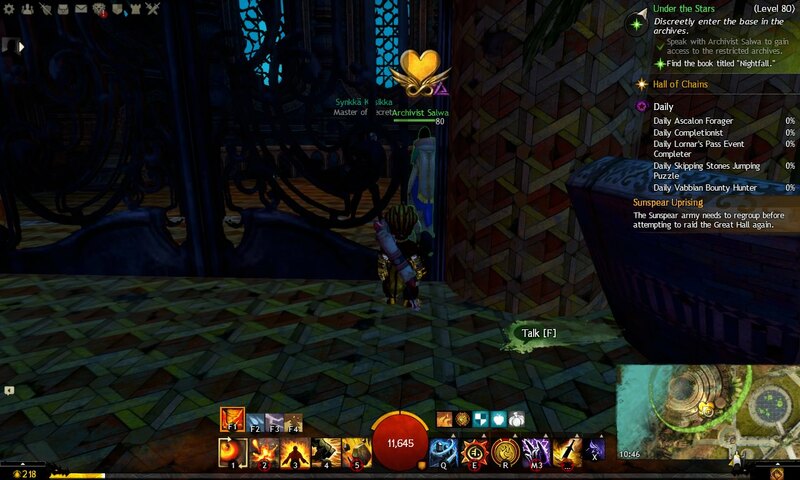 Just discovered there is a missing balcony in the Rata Sum - Applied Development Lab (Home) instance, the 'hitbox' is there for mini pets and the instance pets. 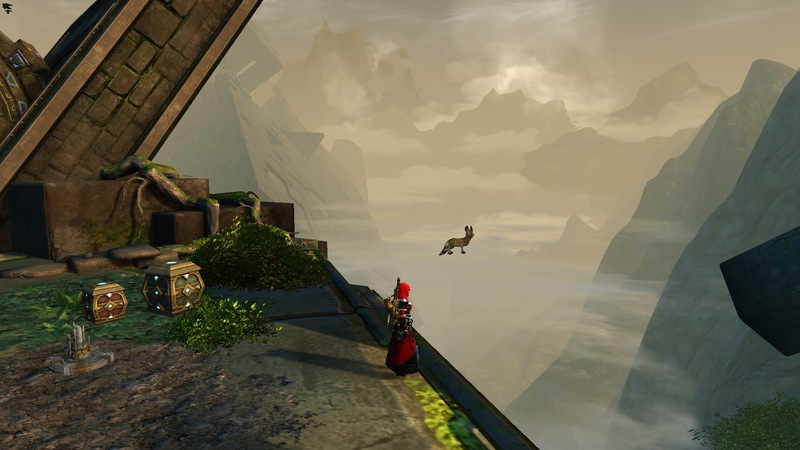 In the open world version (in Rata Sum) the balcony is there. 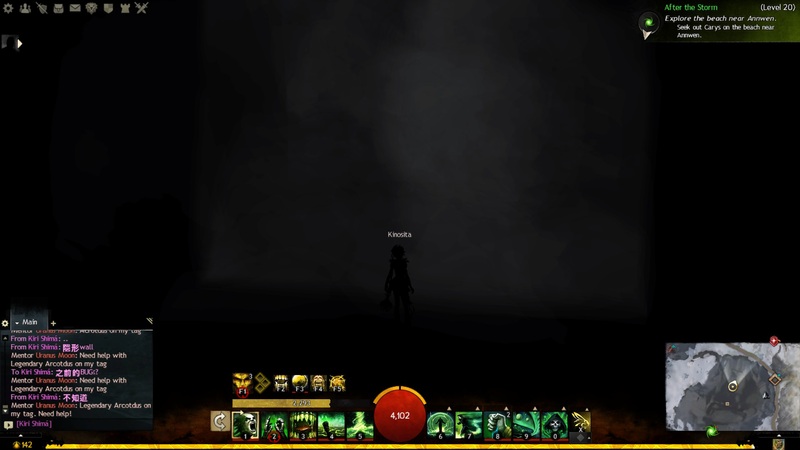 when i go to see point in Windy Cave in Lornar's Pass,i just fall on the road , then fall into the area of darkness , but can see that ceiling has roads is it a bug?